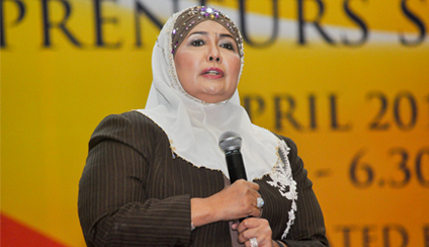 BANGI, 23 Apr 2014 – A committed entrepreneur needed to exude confidence to clinch a deal and then remain focused to fulfil the promises made, so said one of the country’s most successful woman entrepreneur, Datuk Dr Maznah Hamid. She was giving her motivational talk at the National Young Entrepreneurs Summit 2014organised by the National University of Malaysia (UKM) here recently. She said apart from having such qualities, an entrepreneur who wants to be successful must also be convincing and dedicated to his business while needing to be engaging and being able to make friends easily. “They must also be good listeners, be friendly and not shy away from an opportunity that might come only once in a life time,” she told the 250 students from public and private universities taking part in the one-day summit. Speaking from personel experience, she said entrepreneurs must be tough and be able to withstand the inevitable hardship that comes when starting a business. They must also stick to their guns and not falter or give up but work to ensure their game plan bears fruit. For every success there are also failures but such failures should not get a person down. Starting with a capital of just RM5,000 Maznah opened her security guard service 30 years ago. Acknowledged as a respected entrepreneur currently doing well in the security services business, she made a courageous decision to take up an offer from the Home Ministry to acquire a security firm which was almost liquidated. She managed to turn the company ‘Securiforce’ into a nationwide-recognised industry player. Born in Jerlun, Kedah and dubbed the ‘Iron Lady’, she was the first woman to manage a security services company, a field dominated by males. She was quick to admit that a successful business can only happen if there is support from the family. Her husband, five children and one son-in-law all contributed to the various companies the family owns. The five-employee company she acquired 30 years ago has now grown into a 5000 staff company that also operates beyond national borders with operations in Singapore, Germany, China and is planning to enter Britain soon.